Posted September 21, 2017 by finnfemme & filed under Beauty, Fashion, Vintage. Chanel was apparently going with the hippie boho flow in the ’70s. This 1972 ad for Chanel No. 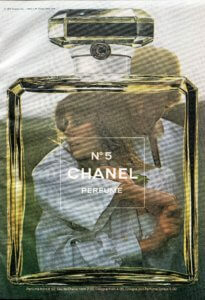 5 perfume shows the iconic glass Chanel perfume bottle superimposed over an embracing couple. The pair is dressed in a gauzy white cotton tunic and dress, and appear to be standing out in a field. This was the time when “natural” scents like musk, civet, and patchouli reigned supreme, so it seemed incongruous to me that hippies would want to wear a fancy French scent. 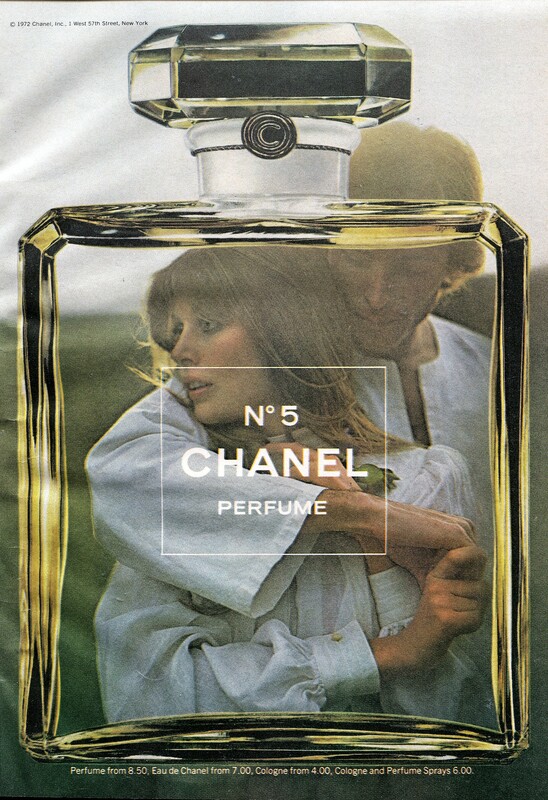 As much of a Chanel freak I am today, I don’t remember wearing Chanel scents in the 1970s (that came later, in the 1980s, after Karl Lagerfeld took over as designer). An unusual ad-campaign indeed, Marilyn! If I remember correctly from the bio-pic, Coco Chanel was a bit of a Bohemian herself, and quite individualistic, a quality that has lately become less common in France. Coco Chanel’s legacy, though, is immutable. It’s great fun to talk about fragrances past & present, since we have memories of them bottled-up inside us for life. I received some No. 5 long ago, and never took to the heady stuff, or it didn’t take to me. I like COCO, which seems more complex and mysterious. And I can swear to never having witnessed the hilarious incongruity of Brad Pitt plugging Chanel (or anything else)–by the way, I’m very fond of his erstwhile wife, the aptly named Ms. Jolie. Speaking of classic perfumes, I have a fondness for White Shoulders by Evyan, which reminds me of Christmas 1960, when my uncle gave it to me for Christmas in miniature, together with a “fur stole” and fake pearls.The sweet floral scent created in 1943 is produced to this day, and White Shoulders cologne can be had for a song on that vast web-emporium based in your home-town. I always have a bottle of that enchanting elixir on hand. And Youth Dew by Estee Lauder reminds me of my swingin’-hip Swedish grandmother in the 1970s, for whom it represented an “old lady style” fragrance. Ironically, she passed her Crumbler’s Cologne on to 20-year-old me. I do enjoy it, now that I am an older gal. But, a little Youth Dew goes a long way. Reading perfume reviews on the web, which is always enlightening, I’ve noticed people who say they cringe at White Shoulders and Youth Dew, so I use the stuff sparingly unless I’m staying home, and then it’s “Spray away, and may it last all day”. Cheers, my witty and resourceful friend. 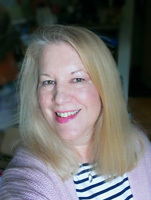 Congratulations on having written copious amounts of useful and amusing material about cultural history, traditional women’s pursuits, clothing and its care, the charms of hanging wash outdoors, and much more. “Musings from Marilyn” is now a classic.